Important and influential figures in science or from other related areas concerning dinosaurs and prehistoric animals. Whilst preparing to undertake a dinosaur and fossil workshop with a year 1 class, one of our team members spotted a superb display in the school hall, highlighting the role of women in science. The concept of working scientifically is one of the key elements of the new national teaching curriculum that has been introduced. It is wonderful to see the role of women in science being showcased to children at primary schools in this way. Celebrating the role of women in science. A school poster showcases some of the leading female scientists and their contribution to building a better understanding about our world. The poster explains some of the principles required to be a scientist such as gathering and recording data, making observations and devising experiments. The work of four women are highlighted on this prominent poster. Firstly, there is the physicist Chien-Shiung Wu, who worked on the Manhattan Project and become the first female tutor at the prestigious physics department at Princeton University in America. Hedy Lamarr, perhaps better known for her acting career but also an accomplished mathematician and inventor is also featured. She helped pave the way for today’s wireless technology. During World War II, Hedy Lamarr worked on a radio guidance system which was more robust and difficult to jam and distort. The principles of her work helped to lead to the development of today’s Bluetooth technology. The poster also features Englishwoman Rosalind Franklin, a biophysicist who pioneered X-ray crystallography (XRC), a method by which the atomic and molecular structure of an object can be determined. Her work helped to reveal the internal structures of complex minerals and most famously DNA. 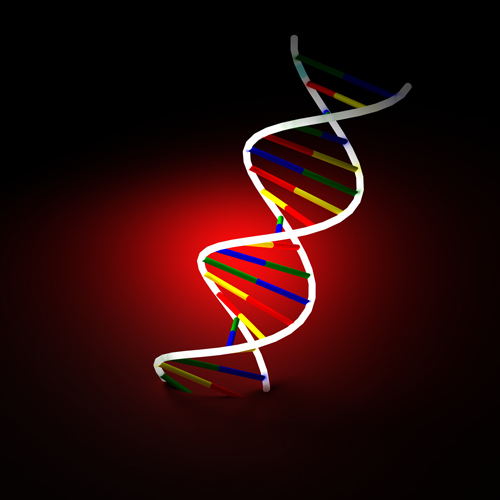 Rosalind Franklin helped to unravel the structure of the double helix of DNA. Last but least, the display poster features the work of astronomer Sandra Faber. Sandra Faber has been instrumental in the Hubble Telescope programme helping to provide some of the most detailed images of the universe ever recorded. Providing such positive role models to young girls may help encourage them with their own experiments in the school science classes. It is important to highlight and celebrate diversity, helping to inspire and motivate the next generation of scientists. When team members at Everything Dinosaur visit the coast of Dorset, they always try and take time out of their busy schedules to visit the grave of Mary Anning and her brother Joseph. The grave of Mary and Joseph Anning can be found at St Michael the Archangel Church, in the appropriately named Church Street in the picturesque town of Lyme Regis. In 1811, Mary along with her brother Joseph, discovered the fossilised remains of an Ichthyosaur, their first major, documented fossil discovery. Within the Church itself, there is a stained glass window that honours the life and work of Mary Anning. It was paid for in part, by members of the Geological Society in recognition of her contribution to this branch of scientific enquiry. The grave of Mary and Joseph Anning. A stained glass window in the church is not the only way in which the contribution of Mary is remembered. Over the last few years it has become something of a tradition to place a fossil or a pebble from the beach on the grave. This is a touching gesture, one that allows tourists as well as professional fossil hunters to acknowledge the work of a pioneer in palaeontology. Everything Dinosaur team members have done much to support the inclusion of the story of Mary Anning and her fossil discoveries within the English National Curriculum. Mary Anning is one of the historical figures included in many study texts and schemes of work associated with English Primary School curriculum. Her life and work provides an excellent role model for many people, especially girls, who can learn about a female scientist, someone who might help and inspire them to take a greater interest in science subjects. Within the town of Lyme Regis, a blue plaque has been erected on the site of the Anning family’s residence and Mary’s first fossil shop. The house has long gone, but in its place stands the Lyme Regis Museum which contains numerous displays of Mary’s fossil discoveries as well as some of her personal effects. The blue plaque commemorating the birth of Mary Anning outside the Lyme Regis Museum. Professor Vince Gaffney, Anniversary Chair in Landscape Archaeology at the University of Bradford, has been honoured with the award of the MBE in the Queen’s 2018 Birthday Honours List. The award is for services to archaeology. Our congratulations to the professor. Professor Gaffney is a world-renowned expert in archaeological landscape studies who, over the last four decades, has engaged with young and old, passionately presenting his subject matter as an exciting and thought-provoking study of people and their environments in the present and the past. He continues to attract tremendous international media interest and to inspire the next generation of aspiring archaeologists. Vince has been the recipient of numerous national and international awards. In 2017, his work in the Stonehenge landscape was awarded the “Research Project of the Year “ and he was recently shortlisted for Archaeologist of the Year by the journal “Current Archaeology”. Five years ago, he received the European Archaeological Heritage Prize and his work also received the prestigious Queen’s Award for Higher Education, for use of novel technology within the Wroxeter Hinterland Project, providing the first comprehensive geophysical survey of a major Roman town in Britain. Professor Gaffney has pioneered the application of computing in archaeology. His work on the Croatian Adriatic Islands provided the first substantial use of geographical information systems (GIS) in Europe. More recently, he has led the UK team creating three-dimensional and virtual imaging of the “Stonehenge Hidden Landscapes”, from an extensive programme of geophysical surveys of the largely unmapped landscape and which will change our understanding of Stonehenge and shape history as well as inform student teaching and learning. His work on archaeological landscapes lost to the sea after the last glaciation received the 2007 award for Heritage Presentation at the British Association for the Advancement of Science. This research was also selected by Research Councils UK as one of top hundred ground-breaking UK research projects as part of its “Big Ideas for the Future” publication. In 2010, Professor Gaffney’s book on this subject, “Europe’s Lost World”, was awarded the “Best Publication” prize at the British Archaeological Awards. Professor Gaffney and his colleagues were also invited to exhibit their work on underwater landscapes in the Royal Society’s Summer Science Exhibition. Approximate maximum extent of marine palaeolandscapes off the Irish and British coasts (survey areas in red). Recently, Everything Dinosaur has featured the research into the hidden landscapes of the southern North Sea basin. This study funded by a European Research Council grant, represents one of the largest, continuous areas to be mapped using geophysical data ever attempted. The aim of this extensive project is to document evidence of human settlement in these hinterlands, prior to the flooding of this part of Europe. Many happy returns to Sir David Attenborough, broadcaster, naturalist and someone who has done so much to help the public understand the wonders of the natural world. Still enthusing about the Natural World – happy birthday Sir David. Throughout a broadcasting career that has spanned more than sixty years, Sir David has played a prominent role in highlighting the plight of the natural world. In the recent, BBC television documentary series “Blue Planet II”, the damage caused by plastic pollutants in marine environments was emphasised and this has led to a number of plans and initiatives to reduce plastic use, especially items that are classed as “single use plastics”, such as plastic drinking straws. The team behind “Blue Planet II”, including the narrator, Sir David, has helped raise awareness about the dangers of plastic pollution. In the highly praised television series, there was one particularly distressing scene where a mother pilot whale was filmed holding her dead calf, which is believed to have died after consuming the mother’s milk which had been contaminated with toxic chemicals resulting from the breakdown of plastic in the marine environment. Sir David raising awareness about the problems of plastic pollution. Sir David Attenborough was born on this day in 1926, all the team members at Everything Dinosaur would like to take this opportunity to wish Sir David many happy returns. With International Women’s Day having been very much in the news this week, Everything Dinosaur is taking this opportunity to honour two female pioneers in the Earth sciences, both called Mary. Today, March 9th, is the anniversary of the death of Mary Anning, the famous amateur fossil collector from Dorset who did much to bring the amazing geology of that part of the coast of southern England to the world’s attention. It is only in the last few decades that her contribution to the nascent science of palaeontology has begun to be recognised. As part of our continuing work in schools, we have developed a lesson plan based around researching the life of Mary Anning for Key Stage 1 and Key Stage 2 pupils. A non-chronological report exercise based on the life and work of Mary Anning. A non-chronological report is a non-fiction report that is not written in time order. Usually written in the third person, these reports help children to practice structuring texts and working with a variety of writing styles. They involve a planning phase in which the compiler has to research the subject area and to decide what to include or discard. It helps children to evaluate sources of information, encourages cross-checking of references and provides the opportunity for the teacher to check learning. Everything Dinosaur’s lesson plan includes a template for the creation of a non-chronological report focused on the life and work of Mary Anning. Google pays tribute to Mary Anning (1799-1847). The British palaeoanthropologist Mary Leakey, who along with her husband Louis, did much to improve our understanding of the evolution of humankind has also been the subject of a Google doodle. Everything Dinosaur is working towards honouring the work of this ground-breaking scientists by having a blue plaque erected at her childhood home in London. We shall update blog readers with regards to our progress in the near future. Celebrating the role of women in science. Happy birthday Sir David Attenborough! Sir David Attenborough is ninety-one years’ young today. Sir David Attenborough has inspired so many. Although not as active as he was, Sir David continues to take a great interest in natural history and science projects around the world and today, we at Everything Dinosaur take time out to honour this naturalist and broadcaster who has done so much to raise the profile of the natural world. Over the last twelve months or so, Everything Dinosaur have published a number of articles inspired by Sir David. For example, back in August, we wrote about a pocket-sized marsupial lion that had been named in honour of the English broadcaster: Attenborough’s New Kitty. Our very best wishes to you Sir, we hope you enjoy your birthday. February 3rd, is the anniversary of the birth of Gideon Mantell, one of the early pioneers of the science of palaeontology. It was Mantell who named Iguanodon, the second genus of dinosaur to be erected (1825), although at the time, the Order Dinosauria had itself not been established. Throughout much of his working life, Mantell had a bitter rivalry with Sir Richard Owen. Owen attempted to undermine a lot of Mantell’s research and he even took the credit for some of Mantell’s insights, however, these days, most scientists appreciate the contribution made to the nascent study of ancient life made by this Sussex doctor and amateur geologist. Gideon Mantell did much to fire the public’s imagination for prehistoric animals and monsters from the past. He spent as much time as he could, often at the expense of his own medical practice, studying the strange fossilised bones and teeth that were being found in quite surprising numbers in the local Sussex quarries. Mantell is famous for identifying the fossilised, leaf-shaped teeth of a plant-eating prehistoric animal. He compared the teeth with the dentition of a living iguana, a lizard that had recently been brought to London from Barbados (1824). He was struck by how similar the fossil tooth was to the tooth of the living reptile, but the fossil tooth was much bigger. The tooth study led Mantell to erect the genus Iguanodon (iguana tooth). Just how big was this extinct prehistoric reptile? To calculate the size of Iguanodon, Mantell compared the ancient bones to the bones of, what he thought at the time was its living relative, the iguana lizard. As the scapula (shoulder blade) was twenty times bigger, this and other comparative measurements led Mantell to state that Iguanodon must have been around twenty times the size of a five-foot iguana. The fossil reptile, therefore could have been approximately 100 feet long. Early sketch of the dinosaur Iguanodon, depicted as huge lizard-like creature. The thought of such a huge beast fascinated the Georgian public and academics alike. Our fascination with dinosaurs had begun. Of course, Mantell’s simple linear scale was incorrect, even the largest iguanodontids were only around nine to ten metres in length. Still sizeable, but not the thirty metre plus leviathans that Mantell had envisaged. In addition, extensive revisions to the Iguanodon genus and the Iguanodontidae family has led to the change of the holotype for this species from the isolated teeth and partial remains identified by the Sussex doctor. The original holotype material (assigned to Iguanodon anglicus), consisted of teeth and fragmentary bones. The International Commission on Zoological Nomenclature (ICZN) ruled in 2000 AD that the type species be changed to the I. bernissartensis with the new holotype IRSNB 1534, a much more complete specimen which was part of a treasure trove of Iguanodon fossils (at least thirty-eight individuals) discovered in a Belgium coal mine in 1878 and studied by Louis Dollo. A fossil teeth assigned to the Iguanodontidae. A memorial has been erected to Gideon Mantell, it is located in the village of Cuckfield, near Haywards Heath (West Sussex, England). It was from Cuckfield that many of the fossil remains of the Iguanodon were discovered. Dr Mantell received a sandstone block that contained an array of dis-articulated Iguanodon bones. This huge block of stone is on exhibit at the London Natural History museum, it has been nick-named the “Mantell-piece”. Happy birthday Gideon. Today, Wednesday 4th January, is the last day that the Diplodocus replica, affectionately named “Dippy” will be on display at the Natural History Museum, London. The twenty-one metre plus plaster cast fossil exhibit will be dismantled starting tomorrow, part of preparations to turn this iconic dinosaur skeleton into a touring exhibit for the museum. The Diplodocus skeleton has graced the Hintze Hall since 1979, but the museum authorities have decided that “Dippy” must make way for another skeleton, a massive female Blue Whale (Balaenoptera musculus). The Blue Whale has been housed at the museum since 1891, the whale skeleton, actual bone, has been part of the vertebrate collection for longer than the Diplodocus replica. The unfortunate whale was injured by a whaler and subsequently beached at the mouth of Wexford Harbour (Ireland), it was acquired by the museum and it has been on display in the Hall of Mammals, but it will soon be taking centre stage and welcoming visitors at the Cromwell Road entrance. The proposed Blue Whale exhibit for the Hintze Hall. The Blue Whale, the largest exhibit of its kind (as far as Everything Dinosaur team members are aware), is not the first huge whale to grace the Hintze Hall. In the late 1890’s a Sperm Whale skeleton (Physeter macrocephalus) was located in a central position in the spacious gallery. “Dippy’s” story began in 1898, when construction workers building a railway in Wyoming, discovered the spectacular fossilised bones of a Diplodocus. Scottish-born millionaire and philanthropist, Andrew Carnegie, got to hear about it and he acquired the 150 million-year-old fossil bones with a view to making the Diplodocus the centrepiece for the Carnegie Museum of Natural History (Pittsburgh, Pennsylvania). During fossil preparation and reconstruction of the mounted skeleton, American palaeontologists noted a number of anatomical differences between the Carnegie specimen and the original holotype Diplodocus material that had led to the erection of the genus back in 1878. This meant that the Wyoming Diplodocus acquired by Mr Carnegie was a new species, the specific epithet Diplodocus carnegii was established, the trivial name honouring the Scottish-born industrialist. King Edward VII viewed a sketch of the Diplodocus skeleton whilst visiting Andrew Carnegie in Scotland. The King remarked how he would very much like to see a similar exhibit at the British Museum (the formal name for the Natural History Museum, London). Carnegie wanted to indulge the King and he commissioned a plaster cast replica, one of ten replicas of the original fossil material that were eventually created. The Diplodocus replica was sent to London in January 1905 and it was formally unveiled at the museum on May 12th that year. The Natural History Museum Diplodocus prior to its unveiling 1905. For many decades, the 292 individual bones that make up the Diplodocus skeleton were kept in the same anatomical position. Although, our understanding of Sauropod anatomy has increased enormously since “Dippy” was first mounted. Two major revisions have occurred over the last fifty years or so. Firstly, the head has been raised and the snout of the dinosaur points forward. In the picture below, the head is dipped and the snout is pointing towards the floor at around a forty-five-degree angle. Ironically, in the 1905 photograph above, the head is in a position more akin to the modern interpretation of the head posture of a diplodocid. The Carnegie Diplodocus replica on display. In 1993, a second major revision took place. The tail of the dinosaur was raised off the ground and given a more “whip-like” appearance to demonstrate a greater range of movement. Research, in conjunction with a lack of tail drag marks in Sauropod fossil tracks, had shown that these dinosaurs walked with their tails held out behind them. The tail raised off the ground helped to counterbalance the head and neck. It is a sad day for many fans of dinosaurs, to see the removal of “Dippy” from the Cromwell Road entrance to the museum. However, once cleaned “Dippy” is embarking on a nationwide tour in early 2018 and plans have been announced to exhibit a bronze replica of the iconic dinosaur in a newly landscaped area outside the museum. This replica, which will be created using the original display, has already been nick-named “Son of Dippy”. Future visitors to the London Natural History Museum will be able to get their “Diplodocus fix”, but for the moment, we bid farewell to the Diplodocus replica, an exhibit that has been seen by an estimated 90 million visitors and one that has inspired generations of palaeontologists. On this day in 1926, the English naturalist and broadcaster David Attenborough was born. Today, we celebrate Sir David’s (he was knighted in 1985), ninetieth birthday. His contribution to our understanding of the natural world has been immense. He can now add the title of nonagenarian to his array of awards and accolades. On behalf of everyone at Everything Dinosaur we would like to wish Sir David “many happy returns”. Happy ‘Birthday Sir David Attenborough. Today, a lot of media outlets will be paying tribute to the body of work with which Sir David Attenborough has been associated. He has been a part of so many people’s lives and documented our rapidly changing world. Through his eyes and his narration we have seen and heard about this remarkable ecosystem that we are very much a part of, but sadly, most of us have lost touch with. In the office over this weekend we have been sharing our thoughts about some of the amazing programmes, many of which were ground-breaking documentaries that this stalwart of British broadcasting has worked on over a BBC and programme making career that extends to more than six decades. Some of us remember watching a programme called “Fabulous Animals” which was broadcast in the mid 1970’s and (if we recall correctly), was shown during the summer holidays. In this series, David (not to be knighted for another ten years or so), explored stories relating to mythical creatures such as mermaids, griffins and the Loch Ness monster. These programmes have not been seen by any of us for half a lifetime, but we can recall the enthusiastic presenter explaining and enthralling us with tales of these astonishing creatures. The documentary series “Life on Earth” was to follow, a joint venture between the BBC and Warner Bros/Reiner Moritz Productions, a thirteen-part documentary series that charted the story of life and evolution. This seminal and highly influential television series was to form the basis of a body of work that, in our opinion has not been surpassed. As a young boy growing up in the county of Leicester, Sir David was passionate about fossil collecting, an enthusiasm he still has, although sadly with dodgy knees and a pacemaker, his days of clambering over rocks in search of petrified evidence of ancient life might be behind him. Nonetheless, as a presenter and narrator he has still played a pivotal role in enthusing the next generation of budding palaeontologists and fossil collectors. 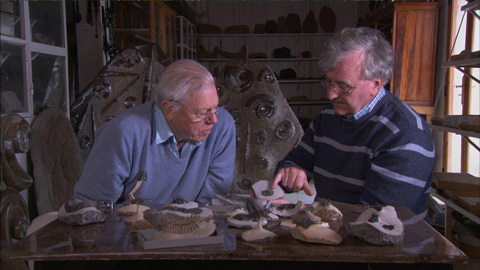 Sir David Attenborough discussing Trilobites with Professor Richard Fortey. Over the next few days the BBC will be showing a number of programmes and documentaries that celebrate the work of this much admired naturalist and broadcaster and last week it was announced that Sir David’s first foray into television “Zoo Quest” was to be broadcast in colour for the first time. Sir David has been honoured on numerous occasions and has a number of living and extinct species named after him as well as a polar research vessel. For example, back in 2008, when Sir David was a sprightly eighty-two year old, Everything Dinosaur reported on the discovery of a placoderm fossil in Australia that showed evidence of viviparity (live birth). The animal was named Materpiscis attenboroughi: A Fishy Tale Indeed and fans of marine reptiles will know that the Pliosaur Attenborosaurus conybeari honours Sir David and the 19th Century English geologist William Conybeare. Named in honour of Sir David Attenborough. From all of us at Everything Dinosaur, happy birthday Sir David.